Our theme for the delegation is Great Compassion as embodied by Guan Yin Bodhisattva. Guan Shi Yin Bodhisattva (or simply “Guan Yin”) is considered an embodiment of Great Compassion. Her name literally means “She who Hears the Cries of the World.” As a Bodhisattva who is dedicated to the welfare of all beings, she listens deeply to each of our sounds and responds accordingly. The event held in Poland will give us a chance to investigate more deeply into many aspects of great compassion and wisdom embodied by Guan Yin Bodhisattva. We will be encouraging everyone to discover all of these qualities that comes from the same source that is found within us. 21st September – 4th October 2017 r.
8:30 -10:00 pm questions and answers session with Rev. Heng Sure – the chairman of the Delegation of monks and nuns of the city of 10,000 Buddhas. “One mind” is a rare film image of one of China’s most severed and respected communities in China. Minisi Monastery Chan Zhenru follow the strict monastic principles created over 1200 years ago by the patriarchs of the founders of Zen in China. In harmony with their land, they run a farm, grow tea and collect bamboo for fuel in the kitchen. At the heart of this community, an isolated group of meditation practitioners sits in silence for 8 hours a day. The impressive zen version of “Great Mind” (Die grose Stille, directed by Philip Groning, 2005) “One Mind” proposes a personal look at the thriving Buddhist community in modern China. Adress ul. Solec 24, 00-001 Warszawa. Meeting with Vietnamese monks and the Vietnamese community, Dharma talks and lunch. ul. Solec 24, 00-001 Warszawa. In this lecture, Rev Heng Sure will investigate how Guan Yin Bodhisattva (Avalokitesvara) provides, for Buddhists in Asia and the West as well, a feminine representation of Great Compassion (Mahakaruna) . An introduction to the Buddha’s teaching on the Bodhisattva path, providing a “practice-centered” interpretation of the compassionate aspects of the Flower Garland Sutra, a text often considered to be a pinnacle of Buddhist philosophy and cosmology. Speakers: Rev. Heng Sure, monks and nuns from City of 10.000 Buddhas, and laity. In the roundtable conversation format, this session will provide an opportunity to ask questions face-to-face with Buddhist monastics and laity. First time in Poland! Everyone is welcome! Historically, wherever Buddhism traveled it changed each new culture it encountered and was in turn changed by each culture. 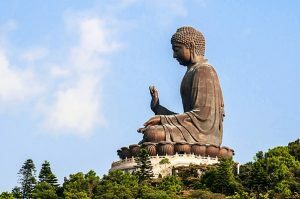 Western culture, with its emphasis on science, psychology, democracy and anthropocentrism will likely follow the pattern and feel the influence of Buddhism’s teachings. Here are four areas where that influence will perhaps first appear.